Grouplove (also typeset as GROUPLOVE) is an American indie rock band that was formed in 2009 by Hannah Hooper (vocals, keyboards), Christian Zucconi (vocals, guitar), Sean Gadd (bass), Andrew Wessen (guitar, vocals), and Ryan Rabin (drums). Grouplove formed out of a friendship among the five members of the band. Hooper met Zucconi on the Lower East Side of Manhattan after hearing and enjoying his music from his former band ALOKE. Despite having just met, Hooper invited Zucconi to an artist residency in Crete she was leaving for later that week. It was at the Ikarus artist commune in the village of Avdou where they met the rest of the band, Andrew Wessen, Ryan Rabin, and Sean Gadd. Rabin, an accomplished drummer and producer, grew up in Los Angeles with Wessen, a surfer and guitarist. Rabin comes from a musical family – his father is Trevor Rabin, former guitarist of Yes. Sean Gadd, a songwriter and guitarist from London, was also at the commune. The friendship between the members formed quickly, but the band did not form until a year later after Gadd, Zucconi and Hooper pooled their funds together and made a trip to Rabin's Los Angeles recording studio. They played their first show at El Cid in Los Angeles on May 10, 2010. Later that year, the band went on tour with Florence and The Machine on the west coast, and then The Joy Formidable on the east coast. By November, Nylon Magazine recognized Grouplove as one of the top ten in the "Best New Bands in 2010." Before even signing with Canvasback/Atlantic Records the band was in a money rut and had to license the song "Getaway Car" to HBO's "How to Make it In America" just to get by. 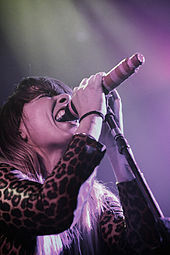 Eventually the band was signed and decided to re-release their self-titled EP, Grouplove, on January 25, 2011. In 2011, the band co-headlined a cross-country tour with Foster the People, and made appearances at Lollapalooza, Outside Lands, Reading and Leeds Festivals, and Glastonbury. The band released its debut album, Never Trust a Happy Song, on September 13, 2011 through Canvasback/Atlantic Records. They released 4 singles from the album – Colours (which featured on FIFA 12 game), "Tongue Tied" (which went on to score the band a no. 1 on the US Alternative Chart and featured in several commercials (including one for Apple, and one for Coca-Cola) and an episode of Fox's Glee) Lovely Cup and Itchin On A Photograph. In support of their debut album, the band went on a headlining North American Fall tour and also performed with Two Door Cinema Club as their main support. In December, the band performed at KROQ Almost Acoustic Christmas, which takes place at the Gibson Amphitheatre, in Universal City. On January 3, 2012 the band kicked off their sold-out headline tour in Australia at the Factory Theatre in Sydney and continued their tour in Europe in February. The band began their US Spring 2012 tour on March 6 in Burlington, VT in support of Young The Giant. Throughout the sold-out headline tour the band had featured stops at Coachella Valley Music and Arts Festival, Sasquatch! Music Festival, and Bonnaroo Music and Arts Festival. On September 17, 2013, Grouplove's second album, Spreading Rumours, was released. That same day, Grouplove played a sold out show at the Troubadour in West Hollywood with supporting Australian band, The Rubens. The band then embarked on an 18-show US tour, the Seesaw Tour, on which they played in 9 cities, with two dates in each city – one a more standard show, the other a more stripped back show. They were supported on this tour by The Rubens. On April 22, 2014, Sean Gadd tweeted, "Thanks for all the love. Grouplove is family and still my favorite band. Sending love. GROUP", leaving his status with the band up in the air. He has posted a song on YouTube called "Dream With Me". On June 19, 2014, Sean Gadd tweeted a series of tweets about his status in the band, the last one officially confirmed his leaving of the band, "I'm so sorry I made a big mistake. I'm making an announcement of why I'm leaving grouplove forever x." This was followed by a post on the band's website officially announcing his departure. The band played at several festivals in 2014, including Bonnaroo, Lollapalooza, Firefly and Coachella, and will headline the Honda Civic tour in late August/early September, supported by Portugal. The Man. While on tour that year, they performed a cover of Beyoncé's hit single, "Drunk In Love". The band have contributed original songs "Let Me In", to the soundtrack for the movie The Fault In Our Stars. They also contributed an original song, "Everyone's Gonna Get High", to an episode of the second season of the HBO series Girls; and another song, "Underground", to the 2012 Tim Burton movie Frankenweenie. In 2014, they provided the end title song for the Netflix original series BoJack Horseman and the song "No Drama Queen" for Paper Towns. Grouplove released their third studio album, Big Mess, on September 9, 2016. On July 15, 2016, the band released the lead single from the album, "Welcome to Your Life". The band also announced a world tour which began in August 2016. Grouplove donated $1 from every ticket sale of their 'Big Mess' world tour and raised $40,387 for charity: water. On May 9, it was confirmed that, alongside K.Flay, the band will be a supporting act for Imagine Dragons' upcoming Evolve Tour, in support of their upcoming third studio album Evolve. Grouplove's first single, "Colours", reached number 15 on Modern Rock charts. It was also featured in Madden NFL 12, FIFA 12, and MLB 2K12. The song was also offered as a free download on iTunes for the week beginning September 12, 2011. In November 2011, the band’s second single "Tongue Tied" appeared in an iPod Touch commercial. The song steadily grew in popularity, and, after 26 consecutive weeks on the Modern Rock radio chart, hit #1 in June 2012. "Tongue Tied" has been RIAA certified Platinum and sold over 1,000,000 singles to date in the US, and has gone gold in Australia and Canada too. "Tongue Tied" was also used and performed by the cast of Fox's Glee in a May episode of the series, and also featured in a Coca-Cola advertisement. It also appears in the Gameloft racing game GT Racing 2: The Real Car Experience. Later it was used in the movies Blended with Adam Sandler, and Project Almanac. In the voting for Australia's Hottest 100 presented by Triple J, "Tongue Tied" was voted #16th and Itchin' on a Photograph at #43 best song's of 2012. Their song "Don't Stop Making it Happen" featured in EA Sports video game, FIFA 17. Which was previously success with "I'm With You" in FIFA 14. A. ^ "Ways to Go" did not chart on the Billboard Hot 100 but did peak at number 20 on the Bubbling Under Hot 100 Singles chart, which is an extension of the Billboard Hot 100. B. ^ "Shark Attack" did not enter the Rock Songs chart, but peaked at number 48 on the Rock Airplay chart. ^ Monger, James Christopher. "Grouplove". AllMusic. Retrieved January 30, 2017. ^ Young, Alex (September 6, 2011). "Grouplove – Never Trust a Happy Song". Consequence of Sound. Retrieved January 30, 2017. ^ Grant, Sarah (October 11, 2016). "Review: Grouplove Still Ambitious, Mostly Innocuous on 'Big Mess'". Rolling Stone. Retrieved January 30, 2017. ^ Hirschman, Shane (September 17, 2013). "Acl 2013 Artist Interview: Grouplove Talk "Spreading Rumours," Relentless Touring". CraveOnline. Retrieved January 30, 2017. ^ "Ryan Rabin Of Grouplove: Down To Business – DRUM! Magazine – Play Better Faster". DRUM! Magazine. Retrieved 2015-04-16. ^ Fortune, Drew. "Interview With Grouplove's Christian Zucconi". A.V. Club. Retrieved 19 September 2013. ^ Emily Damon. "Grouplove To Release Debut EP January 25". Mxdwn.com. Retrieved 2015-04-16. ^ Peters, Mitchell. "Making It In America." International Index to Music Periodicals Full Text [ProQuest]. Billboard, 15 Oct. 2011. ^ "Grouplove Announce Spring 2012 Tour Dates". Mxdwn.com. Retrieved 2015-04-16. ^ a b "Grouplove Announces Fall Headlining Tour". Mxdwn.com. Retrieved 2015-04-16. ^ "The L.A. Times Music Blog". Latimesblog.latimes.com. 2011-11-16. Retrieved 2015-04-17. Also on the bill for Sunday is local pop act Grouplove, folk rockers Mumford & Sons, Noel Gallaher's High Flying Birds project and glossy New Zealanders the Naked and Famous. ^ "Grouplove Announce Slate of National Television Appearances". Marketwire.com. 2012-06-05. Retrieved 2015-04-16. ^ "Fall 2012 Tour Dates Announced….More To Come!". GROUPLOVE Music. Retrieved 8 February 2013. ^ "New Music, New Video, New Album! – GROUPLOVE Official Blog". Grouplovemusic.com. Retrieved 2015-04-16. ^ "iTunes – Music – Spreading Rumours (Deluxe) by Grouplove". Itunes.apple.com. 2013-09-17. Retrieved 2015-04-16. ^ Daw, Robbie. "Grouplove Spread Good Vibes At The Troubadour: Live Review | Music News, Reviews, and Gossip on". Idolator.com. Retrieved 2015-04-16. ^ "Announcing The Seesaw Tour – GROUPLOVE Official Blog". Grouplovemusic.com. 2013-07-29. Retrieved 2015-04-16. ^ "Spring 2014 US Headline Tour Dates On Sale Now – GROUPLOVE Official Blog". Grouplovemusic.com. 2013-12-06. Retrieved 2015-04-16. ^ "Sean Gadd – Dream With Me". YouTube. Retrieved 2015-04-16. ^ "Sean Gadd on Twitter: "I'm so sorry I made a big mistake. I'm making an announcement of why I'm leaving grouplove forever x"". Twitter.com. 2014-06-19. Retrieved 2015-04-16. ^ "a note from Sean – GROUPLOVE Official Blog". Grouplovemusic.com. Retrieved 2015-04-16. ^ Bedian, Knar. "Mad Hops: Grouplove". Sound of Boston. Sound of Boston. Retrieved 2 October 2014. ^ Chris Martins (January 22, 2014). "Grouplove Thrill in 'I'm With You' From New York Concert Documentary". Spin. Retrieved January 30, 2014. ^ ""Let Me In" Video – GROUPLOVE Official Blog". Grouplovemusic.com. 2014-05-07. Retrieved 2015-04-16. ^ "Grouplove – Everyone's Gonna Get High [Official Audio". YouTube. 2013-01-11. Retrieved 2015-10-12. ^ "Grouplove ( Underground ) Soundtrack . Frankenweenie". YouTube. 2012-10-02. Retrieved 2015-10-12. ^ "Paper Towns (Music from the Motion Picture) by Various Artists on iTunes". Itunes.apple.com. 2015-07-10. Retrieved 2015-10-12. ^ a b c "Grouplove Announce New Album Big Mess, Plus a World Tour". Paste Magazine. 2016-06-20. Retrieved 2016-07-11. ^ "Grouplove announce new album Big Mess with psychedelic trailer". Entertainment Weekly. 2016-06-20. Retrieved 2016-07-16. ^ "Grouplove raise over $40,000 for charity: water following 'Big Mess' world tour". Vaunter]]. 2017-03-15. Retrieved 2017-03-15. ^ "Imagine Dragons Returning to Minnesota This Fall with New Tour". 106.9 KROC. 9 May 2017. Retrieved 10 May 2017. ^ Beth Montgomery (2011-09-16). "iTunes: Colours-Single By Grouplove FREE Download". Ingoodcents.com. Retrieved 2015-04-16. ^ "Apple iPod Touch TV ad – Share the fun". Retrieved 2013-01-28. ^ "Grouplove Goes to #1; LA-Based Quintet's Hit Single "Tongue Tied" Tops the Modern Rock Chart; Band Performs "Tongue Tied" on NBC's Tonight Show With Jay Leno Tomorrow Night; Performance on NBC's Today Set for July 9". Retrieved 2013-01-28. ^ "ARIA Charts – Accreditations – 2012 Singles". Retrieved 2013-01-28. ^ "#16: Grouplove – Tongue Tied". Retrieved 2013-01-28. ^ "Allmusic.com Grouplove Award listing.". Retrieved 2013-01-28. ^ "NASCAR The Game: Inside Line Soundtrack". Retrieved 2013-01-28. ^ a b c d e f g h "Grouplove – Chart History". Billboard.com. Retrieved 2015-04-16. ^ "Grouplove – Alternative Albums Chart History". Billboard.com. Retrieved 2016-10-16. ^ "Grouplove – Rock Albums Chart History". Billboard.com. Retrieved 2016-10-16. ^ a b "DISCOGRAPHY GROUPLOVE". Australian Charts. Retrieved 2 August 2016. ^ "ARIA Report 1220" (PDF). Pandora.nla.gov.au. Retrieved 2013-07-27. ^ "Canada Rock". billboard.com. Retrieved 2 August 2016. ^ "Grouplove – Chart History: Japan Hot 100". Billboard. Prometheus Global Media. Retrieved March 1, 2016. ^ "Grouplove Official Charts". Official Charts. Retrieved 2 August 2016. ^ "ARIA Charts – Accreditations – 2012 Singles". Australian Recording Industry Association. Retrieved December 13, 2012. ^ "Canadian certifications – Grouplove". Music Canada. Retrieved December 13, 2012. ^ "American certifications – Grouplove – Tongue Tied". Recording Industry Association of America. Retrieved December 13, 2012. ^ "New Releases 21–11–11". Official Charts Company. November 21, 2011. Retrieved May 19, 2014. ^ "Future Releases on Alternative Radio Stations". All Access Music Group. Archived from the original on June 20, 2014. ^ "Billboard.biz search: Bubbling Under Hot 100". billboard.com. Retrieved 30 January 2017.